Former 90 Day Fiancé star Evelyn Cormier is trying her hand at another reality TV show. 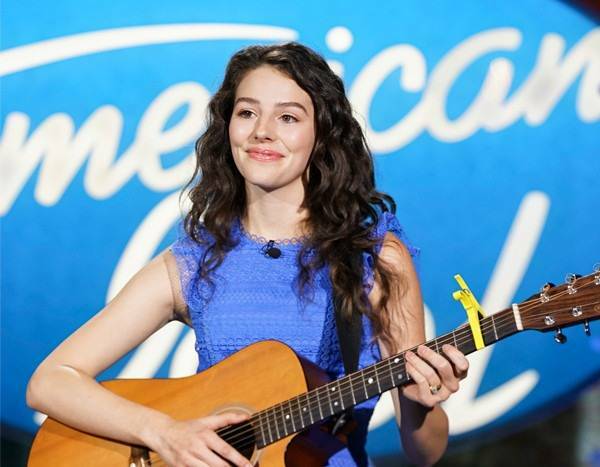 Evelyn auditioned for American Idol this year and her episode aired on Sunday night. Not only did the singer make it through to Hollywood, but she also got a very special compliment from one of the judges, Katy Perry. She sang Chris Isaak‘s song “Wicked Games” and afterwards received lots of high praise from Perry, Lionel Richie and Luke Bryan. The season 5 star wore an American Idol blue dress and black combat boots. When she first stepped up to sing, Bryan initially thought she was Rachel McAdams from The Notebook. After showing off her wedding ring (happy one year anniversary! ), Evelyn began the tune. The 19-year-old’s eyes started welling up while receiving the accolades from the judge panel. Evelyn received that fateful golden ticket and she’s off to Hollywood to compete on the big stage! The singer revealed on Instagram in December that she auditioned for the show and has since been sharing updates leading up to the big night. According to her website, the New Hampshire native has an EP called Ghost as well as a number of singles. Watch her full audition above. Congratulations on the big ticket to Hollywood, Evelyn!